A subject term is a standardized word or phrase that describes a main idea in the article. When an article is added to a database, the database will assign subject terms to it from the database's list of subjects. Most articles will have from 3 to 12 subject terms assigned. Each database has its own list of subject terms. They often contain technical jargon and odd punctuation, so you often won't be able to figure out the subject terms on your own. You will have to identify the subject terms in the database, and then use them in a search. Most databases make and use their own subject terms, but some databases are known for their specialized lists of subject terms. For example: ERIC Descriptors and MESH Headings. In the EBSCO databases the subjects are listed under the publication information for an item. In ProQuest databases, click on the title of the article to be taken to the Abstract/Details page, and then scroll down to the Search with indexing terms box toward the bottom of the page. There are a couple of ways to search with subject terms. Use the subject term as your search term and search as usual. This will bring back results with that subject term, as well as results that have the term somewhere else in the information about the item. Search for the subject term in the subject terms field. 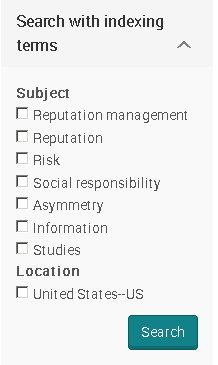 In the EBSCO databases, this means changing the Select a Field (optional) drop-down menu to SU Subject Terms. This will just bring back articles that have been assigned that subject term. Search the Academic Search Complete database for articles about sports activities for people with disabilities. What relevant Subject Terms are listed for the articles? Try a new search using those Subject Terms. How does this change your search?